IntelliTrack® data management software is designed to maintain inventory in a variety of business environments. This user-friendly inventory tracking system combines state-of-the-art bar code data collection on your portable data terminal, with a sophisticated Windows®-based inventory management program for your PC. IntelliTrack Inc.'s IntelliTrack® suite of products offers a relational database to ensure data integrity, portable bar code reader integration to maximize data collection efficiency, and bar code label printing capabilities to improve data collection accuracy. With four specialized modules, the IntelliTrack® product line is designed to custom fit your operation. Choose the module that works best for you – Inventory, Fixed Assets, StockRoom, or Check In/Out. IntelliTrack® 4.0 was created using Microsoft® Access 2002. Each IntelliTrack® module contains the source code and, since Microsoft® Access is one of the most popular development tools, you can easily customize your IntelliTrack® module to meet your specific requirements. IntelliTrack Inc. is a leader in providing businesses with data collection and inventory management tools designed to reduce costs and increase productivity. Each IntelliTrack® software module includes an integrated portable data collection application for several Pocket PC and DOS portable data terminals. Portable data collection applications allow you to perform many of the same functions found in the IntelliTrack® application for your PC, such as physical inventories, moving and tracking items, issuing or receiving stock, and more. 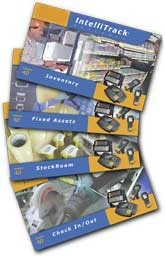 Item Pictures: Each IntelliTrack® product allows you to store a picture with an item definition. This feature allows a user to verify an item visually. This is especially helpful, for example, when a user might be checking out an unusual tool, verifying an asset, or identifying kits. Customization: While IntelliTrack® will meet most users' requirements, situations may arise when you need to add features to IntelliTrack®. Since you receive the IntelliTrack® source code with each product, you can make customizations such as adding a new report or even adding new forms with special processing capabilities. For additional programming expertise, or just to save time, call IntelliTrack®'s Software Services Group. Bar Code Printing: Integrated bar code printing allows you to label your inventory and locations quickly and easily based on the data contained in your IntelliTrack® application. Portable data terminal support and bar code label printing maximize data accuracy and efficiency when collecting inventory information. Easy to Use: IntelliTrack® is a user-friendly Windows® application. Easy menu navigation allows you to quickly perform common inventory tasks.